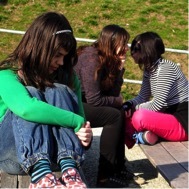 Social anxiety is common in children and adolescents, and it often goes untreated. These students are often well-behaved, quiet, and do their work. Teachers (and some parents) are frequently unaware of the student’s anxiety until it becomes a crisis. Even then, because the anxiety-producing situation seems relatively inconsequential to others, adults may try to encourage the student with words such as “you need to get over it” or “just keep trying” or “don’t be so shy, speak up more” or “don’t be such a perfectionist.” Their implied question is, “Really, how bad can it be?” which reveals a lack of understanding about the severity of the anxiety experienced by the child or adolescent. Without prompt intervention, this devastating form of anxiety can seriously interfere with school attendance, as was discussed in Part 1. When an adolescent successfully avoids a feared social or performance situation, and withdraws even more by staying home, over time the student’s reliance on avoidance as a method of handling anxiety is strengthened. Meantime, the parents often become pulled into the anxiety because of the adolescent’s behavior. An example is when a class presentation is due and the student does not feel adequately prepared. Negative thoughts increase and the student may convince herself that the speech is inadequate or must be perfect, working far into the night. Negative emotions of anxiety, dread, and anticipation of embarrassment increase until near-panic ensues. Negative behaviors such as crying, whining, and agitation may appear. Physical symptoms may flare, and the student may complain of a stomachache, a headache, or have difficulty sleeping. Predictably, the next morning, the student will not get out of bed or get ready for school, and insists on staying home. The parent may end up calling the school to report an illness (stomachache, headache) reasonably observing that the child is exhausted and will likely feel more confident after getting some sleep. This scenario is a typical social anxiety negative loop. Each student’s unique combination of feared situations leads to a cascade of repeating negative thoughts, feelings, physical reactions and behaviors. The crisis begins when the sequence replicates itself in many situations over time. The student discovers the anxiety-relieving strategy of skipping class and staying home from school. The first absence or two may seem understandable to a parent, but then the behavior pattern quickly becomes an established habit. The next problem might be taking a test, writing a paper, having to work with a partner, or an upcoming social event, but to the severely socially anxious adolescent, almost any social situation can become a challenge worth avoiding. In middle or high school, a similar avoidance pattern can be accomplished without the parents’ or teachers’ knowledge, at least for a while. Such students can become masterful at avoiding detection. They may skip some classes, but not all. They may hide in the stairwell or a corner of the library. They may ask for a pass to go to the nurse, but meander in the hallway until the bell is about to ring, stretching the nurse visit into two periods. Or they may go to the nurse and ask to go home due to various physical symptoms. They may ask to go to the restroom and stay away for most of the class period. If they are involved in extracurricular activities, they may take advantage of a pass to work on a project, such that each teacher believes the student is with the other. These behaviors may repeat throughout the school day and no one adult is aware until the habit is well established. When a student misses 40% of class time in a two-week period, about two days a week, the situation is urgent (Kearney, 2007). Students who miss this much school can quickly become overwhelmed with worries about failing a class and about never being able to catch up on school work. They fear having to enter school and face questions about their absences. Without immediate help, students can quickly spiral into a failure loop that results in their refusal to attend school at all. Well-meaning parents and schools sometimes suggest online classes or homeschooling to help the student catch up. But these strategies focus on improving academic success, which is usually not the core problem. Because the underlying anxiety remains, working from home often perpetuates the problem. As the anxiety worsens, many students with social/performance anxiety soon become averse to even attempting a lesson for an online class. Additionally, without the daily demands of social interaction, students with social anxiety who stay home quickly become socially isolated. Without the subtle demands of even a little social interaction outside the home, the child or adolescent does not gain any competing information about other perceived flaws, which leaves them free to imagine the worst. By this point, the student has developed a persistent habit of avoiding real and imagined obstacles despite knowledge that this makes things worse. • Getting an absence slip signed by the classroom teacher when returning to school. The absence slip is often a different color than other papers a student might hand to a teacher, and the student fears this will provoke questions. Or the student perceives the walk to the teacher’s desk as a walk of “shame” and believes that all eyes are on him, judging him negatively. – A student may try to return to school and then one thing goes wrong. The student is not likely to tell anyone at school about a problem unless a “go to person” has been established, and is more likely to revert to a pattern of avoidance, escape, and withdrawal to home. • Answering questions from classmates or teachers about where they have been during an absence. 1. Remember this is urgent. Children and adolescents rarely grow out of school refusal, and the longer they stay home, the harder it is to get back to a normal routine. Staying home actually hinders growth (through strengthening avoidance), and prevents new learning of better anxiety coping skills. 2. As soon as possible, seek help from a mental health professional. • Seek a comprehensive evaluation from a mental health professional familiar with school refusal. The evaluation will help parents quickly understand the best treatment, and the actions required to get your child back on track. • Homebound services are rarely effective in solving anxiety-based school refusal, and often make the problem worse. First find out why the child is having difficulty attending school. Then form a collaborative team with the school counselor or school psychologist, the school administrator, and a CBT therapist to improve your child’s anxiety and behavior. 3. Be a good listener. Calmly talk to your child about what seems to be bothering him about school. Talking about fears can be very helpful. Avoid lecturing or criticizing. Just listen. 4. Be supportive and avoid harsh, dramatic confrontations or demands. Learning to cope with anxiety takes time. Use encouragement for good choices. • Set up regular evening and morning routines, and maintain these over the weekend. A child who is short on sleep still needs to attend school if at all possible to help reset his/her internal clock. • Help your child develop hobbies or find things that interest her to build self-confidence. • Help your child establish a support system at school. This might include siblings at the same school, friends, teachers, the principal, and the school counselor. 6. Learn as much as possible about anxiety, social/performance anxiety, and school refusal. Resources are listed below. 7. Keep your child in school if at all possible. 8. Parents are encouraged to work together to decide where your child will go to school. If at all possible, parents should have a united front and simply inform the child that this is non-negotiable. Allowing the child an option to attend elsewhere may allow her to continue to avoid/escape the problem. 9. Tell your child or adolescent that the problem is solvable, but it may take a little time. Meantime, tell your adolescent that you need her help by doing her best to go to school daily. 10. Ask the school for help in responding to your child’s complaints about school, while continuing to ensure that he goes to school. 11. With older students, work closely with the school to monitor attendance. 12. Meet with the teacher, school counselor and principal for guidance and support. 13. Do not allow your child to stay home because it is near the end of a semester. Schools are required to educate a child every day of the school semester. If a child has fallen behind due to an emotional problem, most schools will work with that student to help him/her continue to learn, and gain as many credits as possible. Some students will become discouraged and feel hopeless about catching up in school. Sometimes a student will appeal to parents to allow them to “start over fresh” the next semester. Many students who plead for a fresh start end up not returning to school, because they have not yet learned how to manage whatever anxiety was creating the school refusal in the first place. The end of a semester is a great time to learn to manage these issues. 1. The situation is urgent, no matter what the time of year. A student who spirals down into a pattern of school refusal may magnify the experience of these few failures into fears of never recovering. 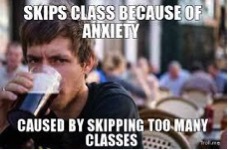 If quick action does not occur, his anxiety may convince him that he is justified in missing the rest of the semester, then the entire school year, and then part of the following semester! Take immediate action if a student seems to be refusing school due to emotional reasons. A team approach is much more effective when it involves key school personnel, the child’s therapist, and the parents. 2. Assessment. A thorough assessment will clarify antecedents and consequences of the school refusal, provide an understanding of the student’s emotional and developmental needs, any academic difficulties, and any parent-related reason for the child’s absence. A common finding is that refusal to attend school is the result of a complex combination of factors. 3. Intervention is urgent, but the intervention needs to be guided by assessment. The longer a student is out of school the more difficult it is for her to return. • Develop a specific plan that addresses steps to be taken when the student refuses to come to school. • Collaborate with the parents in developing the plan. • Remember that parents need a tremendous amount of support. 4. Work with the parents to keep the child or adolescent in school. Allow the student to attend school only in the counseling office if necessary. The goal at this time is not a return to the classroom, but to prevent the student from becoming more comfortable staying home, and to maintain some semblance of a regular schedule. The requirement to show up daily, even for a short time, can help maintain this expectation. 5. Encourage the parents to seek mental health therapy from a therapist trained in CBT. Provide referral information as needed. 6. If there is an opportunity to talk to the student directly, be encouraging about her teachers’ interest in her, and the options to recover grades. Avoid lecturing or warning the student about consequences of absences. At this point, telling the student how to solve a problem is likely to fall on deaf ears. Tell the student you are looking forward to seeing her again soon, when she is ready, and express warmth and interest in her eventual return. 7. Learn as much as possible about school refusal and social anxiety. See resources below. 8. Develop a team of colleagues with a single individual (“case manager”) to serve as the main point of contact for the child or adolescent. Prepare all staff to defer to this case manager before intervening with this student. A single case manager will more quickly detect a student’s renewed efforts to escape/avoid, and can intervene more effectively with this particular student than adults scattered across the campus. Well-meaning teachers or other adults who do not know the student’s patterns of anxiety can become part of the student’s avoidance cycle. 9. The case manager should train the team in specific roles. The nurse for example, has the job of establishing the presence of illness. If no illness is present, rather than allow the student to rest in the nurse’s office or sending the student back to class, the student should be escorted to the case manager. Some students who try to avoid school through illness will not return to class when this strategy fails, but will hide somewhere in the school. 10. Expect to set small goals in the beginning. For example, some students find returning to campus is difficult. With the student, identify obstacles to those goals, and negotiate solutions. The first goal may be simply to get the student to come onto the school campus and stay for 15 minutes. 11. Learn about anxiety interventions that possibly could be carried out by school mental health personnel. For students with anxiety and/or depression, intervention provided by a mental health professional often includes cognitive-behavior approaches that teach coping strategies such as relaxation, problem-solving, reducing negative self-talk and increasing healthy self-talk. Other strategies may include teaching about anxiety, rewards for school attendance, parent training, goal setting, and setting up contracts. 12. Work closely with the school psychologist to develop a plan that is evidence-based. 13. Don’t be too strict or too lenient – either one can backfire. 14. Forced school attendance may be appropriate for a younger student, or a student with relatively mild school refusal. 15. Gradual reentry is usually needed for older students, or those who are very anxious or depressed. Kearney, Christopher. 2008. Helping school refusal children and their parents: A guide for school-based professionals. Oxford University Press, Inc.
King, N. J., Ollendick, T.H., and Tonge, B.J. (1995) School refusal: Assessment and treatment. Boston: Allyn & Bacon. Wimmer, M. B. (2003). School refusal: Assessment and intervention within school settings. Bethesda, MD: National Association of School Psychologists. Wimmer, Mary B. (2010). School Refusal: Information for Educators, In Helping Children at Home and School III. National Association of School Psychologists. • What is Social Anxiety? This entry was posted in Anxiety, Blog, Cognitive Behavior Therapy, Introversion, Performance Anxiety, Self Esteem, Social Anxiety and tagged anxiety, CBT, cognitive therapy, cognitive-behavioral therapy, safety behavior, school refusal, social anxiety, social anxiety counseling, social anxiety therapy, social phobia. Bookmark the permalink.